I just finished reading this silly chick-lit book about a woman who has this list of thirty things she wants to do before turning thirty, and go on as many first dates, too. You know when you need a goofy book in between more immersive books or series to bring you out of that space? Well, this book got me thinking about the things I’d like to do in the next few years (not go on 30 dates, that’s for damn sure). I’m 24, so there’s plenty of time before turning thirty, which also made me realise how young I still am despite what the lines on my face say. 1. I definitely want to write a cookbook, or a few, within the next few years. And improve this blog, and maybe figure out twitter? These are all related, so they count as one item on the list, right? 2. A kid’s book would be nice too, since I have dozens of ideas and a couple of outlines done already. 3. I want to start making cooking videos, and learn how to do video editing. Might as well make full use of the adobe suite that’s taking up so much space on my computer. 4. Yoga class videos, too, since my practice was primarily made up of free online classes before I did my teacher training. 5. We’re moving to Germany in September, which is a big one, but I also want to travel a lot more, especially around Europe. I’d like to see a hell of a lot more of Canada too. 6. Learn a third language, maybe Spanish. Or Swedish? French? Any language, really. 7. Do an Anusara yoga training. And acroyoga. And get Graham doing a lot more yoga so we can do acroyoga. 8. Add a dog/cat/rat to our little family at some point. I doubt the rat idea will fly, lol. I love rodents. 9. Keep doing pottery and get a lot better at it. I need to find a studio in or around Oldenburg. 10. Improve my photography skills. I’m slowly working on it but still don’t know all the settings on my camera. Ten is enough, I think. A few years ago that list would have been all about academic stuff, but I’m so happy it isn’t now! Leaving grad studies was one of the best decisions I ever made. So many of the things I’m doing now were pipe dreams two years ago (when I started this blog!) and it’s so thrilling to see them come into fruition. The only thing I’m not actively working toward right now is #2, but who knows what could happen in the next few years. We’re moving to Germany so I can perfect my German, and so Graham can learn German, and to spend a lot more time with family, which I’m really excited about. Omi will be here in a couple of weeks for Kristina’s wedding, too. I’ve never dreamed about a big perfect wedding and seeing my sister, and Graham’s brother, both planning very expensive, stressful weddings, definitely kept that one off the list. There are way better things to spend that much money on (a house! a trip! a camera!) in my mind. What’s on your list, imaginary or not? 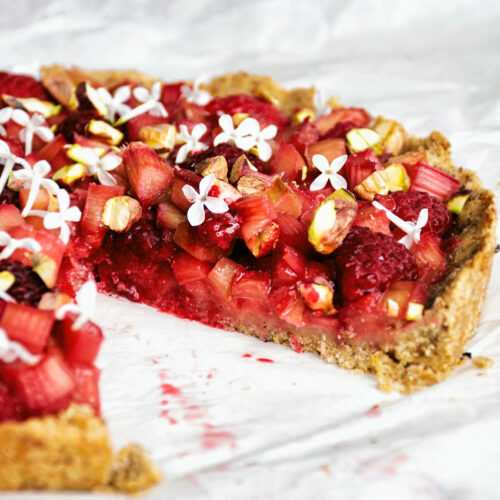 This is another wonderfully seasonal recipe with almost all of the ingredients coming from the garden here, or my aunt, or the farmer’s market. Instead of boiling the potatoes, they’re roasted, which makes a huge difference in the overall flavour of this salad. If you like picnics, or you’re looking for a dish to bring to a potluck, this is perfect. I didn’t share (muahaha) and took about three days to finish the salad. It’s excellent warm or cold, and almost as good on day two and three as it was fresh. 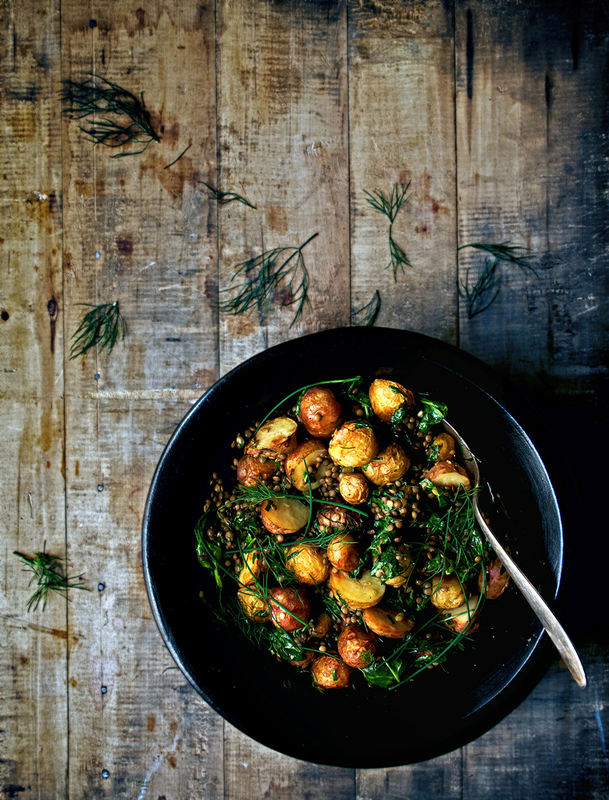 If you’re looking for a more spring-y version of something like this, try my asparagus potato salad. The bright herb dressing is what makes this otherwise simple salad special. It’s definitely meal-worthy, and I hesitate a little in calling it a salad because it is so hearty. The addition of lentils and spinach help in that regard, and adding the dressing while the potatoes are still hot lets in soak right in. I never post recipes for things I wouldn’t make again, but there are some recipes I know I’ll make more than others. This vegan new potato salad has become one of my all time favourites. It beats any other potato salad I’ve made by a long shot, and I know I’ll be making it well into autumn with regular potatoes. Potatoes are the best. We’re going on another camping trip in a couple of weeks and I’m thinking about bringing this since it’ll hold up well for a day or two. That being said, we’re going with Marshall, Graham’s best friend (and my close friend) and the two of them might eat it all on the first night. I never know with those hollow legged boys. 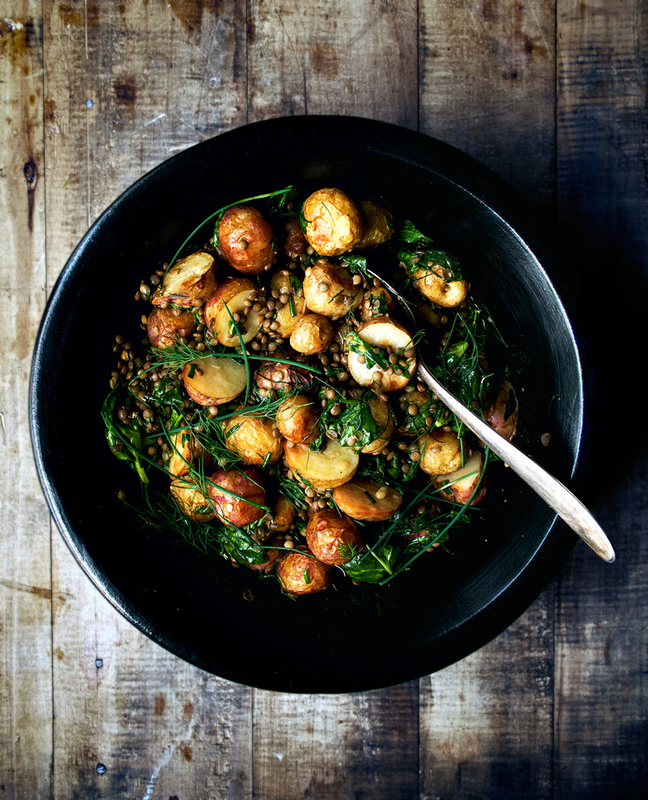 This roasted new potato salad with lentils and a herby dressing is a far cry from standard mayo-filled potato salad - it's very light and a meal in itself with protein-packed lentils and spinach. The herb vinaigrette lifts everything up here, with dill, chives, and a little spicy mustard - perfect for picnics and barbecues. Preheat the oven to 400F/200C and line a baking tray with parchment paper. Scrub the potatoes and cut any larger ones so that they're all roughly the same size (about the size of a golf ball). Coat with the avocado oil and salt and roast for 50-60 minutes, or until golden. 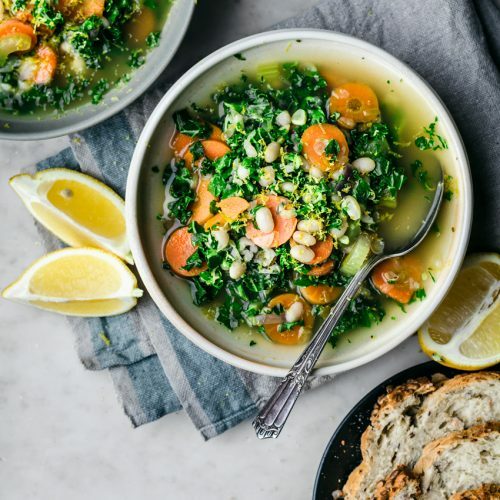 To make the dressing, add the dill and herbs to a small bowl or jar. Add the remaining ingredients and stir to combine. 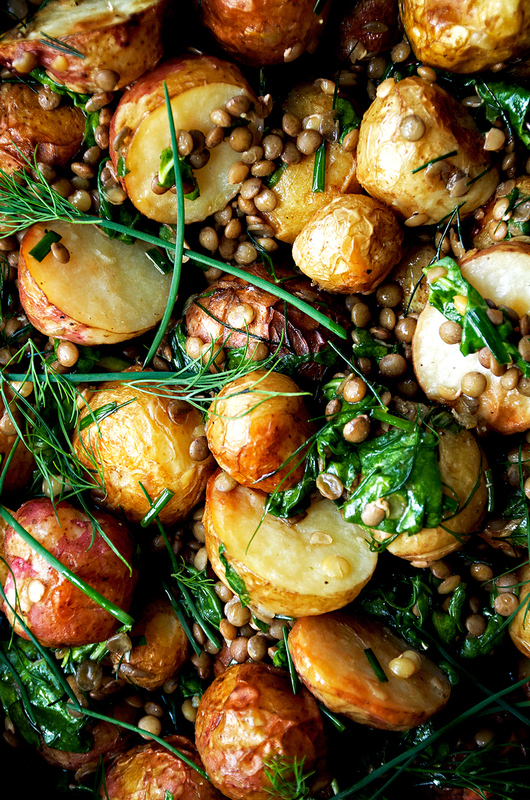 To assemble the salad, place the hot potatoes in a large bowl with the lentils and spinach. Pour the dressing over top and stir until the potatoes are fully coated with dressing and the spinach is wilted. Serve warm or cold. It will keep in the fridge for up to three days. Ohhh I'm in loooove with this pot salad.. just enough vinager for a punch, but the herbs shine! And I love the idea of roasting! Sooo good! Sounds like you've got your priorites in order. It's good to have clear goals. Sometimes there's so much I want to do, I get overwhelmed and do nothing .. (what's that?!) Sheesh! I love your decision on a small wedding – super wise for a woman your age. It's easy for some to get caught up in the glitz and glamor… but the real deal comes after the wedding.. for years. I think a trip or house is longer lasting than an expensive wedding for sure! Good for you for taking off from grad school. I know that must have been a hard decision, but in hindsight, you know now it was the right one. You've so much coming up/going on! Yay you! That cookbook will happen soon. I can't wait! I do the same thing sometimes! We all need a break every once in a while though. Traci, you're the sweetest! Thank you! This looks delicious! Potato salad has always been part of the traditional meal for Christmas. I like the addition of the lentils and your herb dressing looks so good with the salad! These potatoes are cooked to perfection! Your list of goals is fun to read. I am still in grad school and dream of all my creative blogging goals but as you alluded to, while in grad school I can only focus on a few of them right now! Eek. What did you study? Looks fantastic! 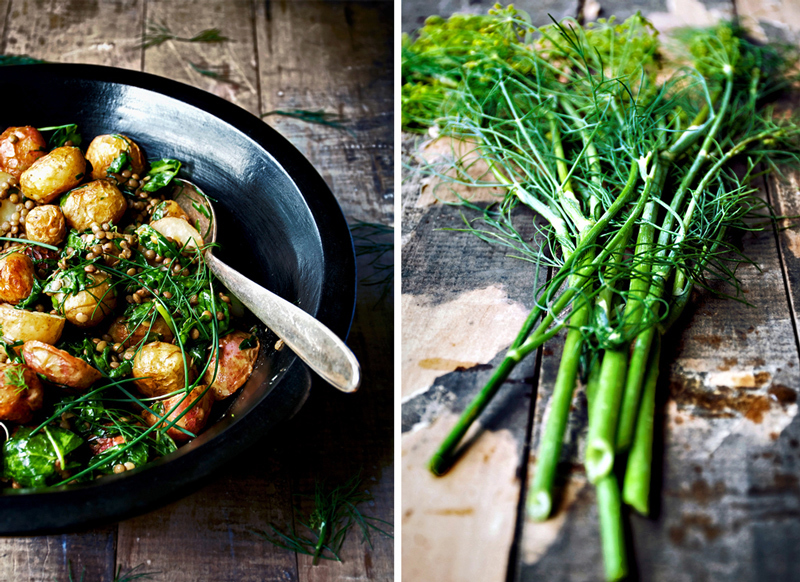 I wish dill was still in season – these photos of me craving it. Your list is extensive! And Twitter deserve it's own spot 😉 JK. All your points sound like great life experiences. Good luck! That herb dressing looks so fresh and irresistible. Love the list of goals. It's always nice to put those things into writing and cross them off once they happen! Hey thanks so much for this recipe. It's really lite for a spud salad and it has now replaced our usual 'german style' potato salad. I forgot to buy potatoes so I'm about to try it with sweet potato….here goes…. How was it with sweet potatoes? I'm happy to hear it! I hope it works out! I make a sweet potato salad that I adapted from this recipe but add extra spices to the sweet potatoes before roasting – I find the texture is different but it still tastes good. These were delicious. I paired them with a maple-dijon green bean dish. Happy to hear it, David! 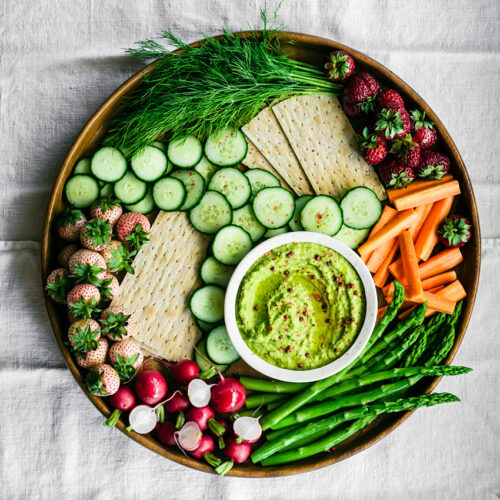 Great recipe, not sure we can get avocado oil in the UK, can you recommend an alternative? Hi Jill! You could use coconut oil as a good high-heat alternative, and choose refined if you're concerned about any coconut taste. Otherwise olive is good! Oh my goodness, this is delicious! I made it for dinner a few nights ago & I'm still dreaming about it. Just read another comment regarding sweet potatoes. What spices do you cook those in when you make this salad? I'm so happy to hear that, Belinda! I use cumin, turmeric, & coriander in equal amounts, and then a little cardamom and salt and pepper. I use parsley or cilantro instead of the dill and chives and leave the mustard out of the dressing. Hope that helps! I love roasted potatoes but they never soften all the way through when I just roast. 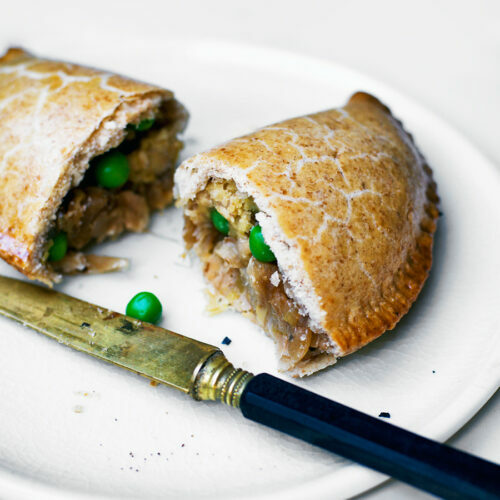 Did you parboil these before sticking them in the oven? Looks delectable! Thanks Erin! No, I don't parboil them, just the direct roast. They're in the oven for an hour though, I've never had any problems with undercooked potatoes for this recipe. If you have a lot of issues with under cooking, then I imagine you could parboil them. 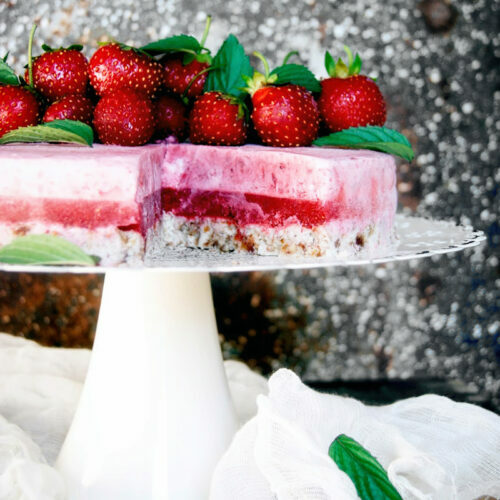 this looks delicious and the photos make it look amazing! I didn't have fresh dill so subbed dry…and no chives so I roasted an onion with the potatoes. I've made several vegan potato salad recipes in the past month. This was THE winner! I loved this recipe! I put it on a bed of spinach/arugula because these potatoes are so good it's easy to sneak more of my greens in! And you inspired me to make a by-30 list (and a by-35 list since 30 isn't too far away for me). Thanks for the inspiration! Woohoo so happy to hear that, and I hope you complete everything on your list and more! Made this for dinner last night. So good! Thanks for the recipe.